See those holes in the top sign? That's where the neon tubing used to go. 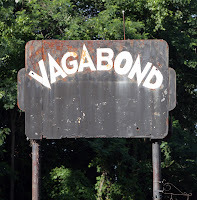 There aren't many vintage neon signs illuminating Route 40 in Harford County, Maryland anymore. Not many left in the entire region. 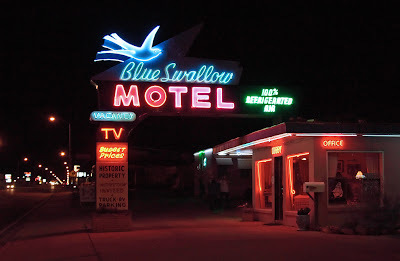 Now look at the bottom sign, it's from the Blue Swallow Motel in Tucumcari, New Mexico. It's beautiful. The owners of the Blue Swallow, like the owners of most vintage motels, couldn't afford to restore their aging signage on their own, they had some help from the New Mexico Route 66 Association. The association, using a government grant, started a "neon restoration project" for the famous old highway. Consequently, Route 66 is a much more interesting place to look at than Route 40. Places don't become desirable destinations on their own; it takes imagination, effort, and money. It seems like preservation and restoration always come last around here. There's never enough money for museums, or art, or parks. And yet there always seems to be cash enough to build money losing stadiums for rich people, or new development handouts for the petit bourgeoisie. Is it any wonder that people are filing lawsuits to keep from moving here? What have we ever done to make this place more livable, more interesting?